Don’t you think it is crazy that people have monkeys as pets? Well, I am at a place that fixes the problems that causes for the monkeys in South Africa. It is a rehabilitation center and I am here to volunteer for 2 weeks. The monkeys here are mostly Vervets and Baboons. Some use to be kept as pets which is illegal in South Africa, but lots are injured by people. This rehabilitation center works very hard to get the monkeys back into the wild. 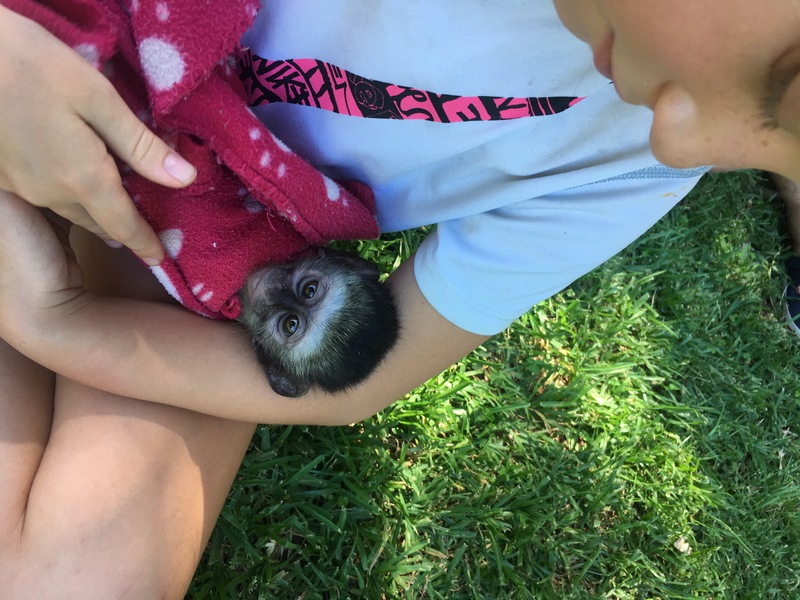 I will tell you a little bit about what I am doing to help here and give you an idea about how hard it is and how long it takes to get a monkey back into it’ natural habit. It takes YEARS of really hard work. Caring for monkeys is hard work but fun. Work starts at 7:00 in the morning but sometimes starts at 6:00 am too! That is 7 days a week. What do we do? We clean the cages (that takes ages because some of the cages are HUGE and there are lots of cages), feed all the animals, prepare all the food (and that is HARD because it is 100’s of monkeys plus chickens, duikers, donkeys and geese), laundry, monitor, harvest grass and food, bath baby monkeys, babysit the sick baby monkeys, clean everything and all areas (keeps deseases away! ), and more!! The fun part is meeting all of the people that volunteer here. I am the youngest one and most everyone else is college age. Also fine is hanging out at all the meals with everyone. They treat me just like another person. Everyone is so fun and they act like I’m just one of the volunteers. Today I even got to ride in the back of the pick up truck. That was so awesome. We have barbecues (barbacues are called braai in South Africa) and we always sit down at every meal like a big family. Mommy and I haven’t had many home-cooked meals so these two weeks have been awesome. I almost forgot to tell you about taking the baboons to the river! It’s the little baboons because once a baboon gets older you can’t play with them at all. But while they are a little we get to take them to the pool and it’s so fun because they stay with us as a big group. Baboons love to be in groups. The best part is going into the cage with the baby monkeys. They crawl all over you and then I love it when you sit in their cage with them. Right now is baby monkey season. Isn’t that cool? What’s not cool is that there are a lot of baby monkeys who don’t have their mommy. That’s the sad part. So it takes a lot of volunteers to keep the baby monkeys healthy and happy. Some of the baby monkeys come here sick and that takes extra extra hard work. Sometimes a sick baby monkey gets carried around in a pouch. They really need their mommy monkey, but a human can make them feel safe and loved while they get better. I bet you’re wondering how these monkeys get rehabilitated. I have already told you that it takes a lot of work and a very long time. I mean years! The husband and wife who own this center are experts at it too. I don’t know much, but I will try to explain what I know. I watched a load full of monkeys get dropped off the other morning. First, the monkeys go to quarantine. Then, after lots of monotoring and test, they will get introduced into enclosures with their species. Then more monitoring and lots and lots of time. Next, they will be introduced into a natural and native enclosure. This time it is totally hands off! That means no human interactions but lots of monitoring!!! Finally, when a troop is strong, they will be released into the wild. It even that takes a long time and lots of monitoring. They will be released to a place that everyone agrees is good for them. Agreeing on the place takes a long time too. It has to be a safe place for monkeys to live! And the release is first semi wild into a temporary fenced in area at the location of the release and with lots more hands off monitoring. They have to be extra sure the monkey troop will survive on their on. Finally the gate will open on the temporary fenced in area and they will build natural bridges over the top of the fence and the monkeys will be free in the wild! After more time and monitoring, the fence is removed from the site. I was suprised how long it takes to find the places to release the troops. You can’t just release a bunch of monkeys anywhere! They have to be a strong family of monkeys to survive and the spot has to be safe with lots of things growing that the monkeys naturally eat PLUS water. Thats a lot of things to figure out! I really enjoyed your post on the monkeys. I did not realize that the baby monkeys are so tiny. You look like you are having a great time taking care of them. Do you get to feed them bananas? Thanks for all the great information! Feeding them was a lot of work!!! 38 heads of cabbages, lots and lots of mangos and bananas! The babies get the same but also get milk and a mixture that looks like oatmeal. WOW! 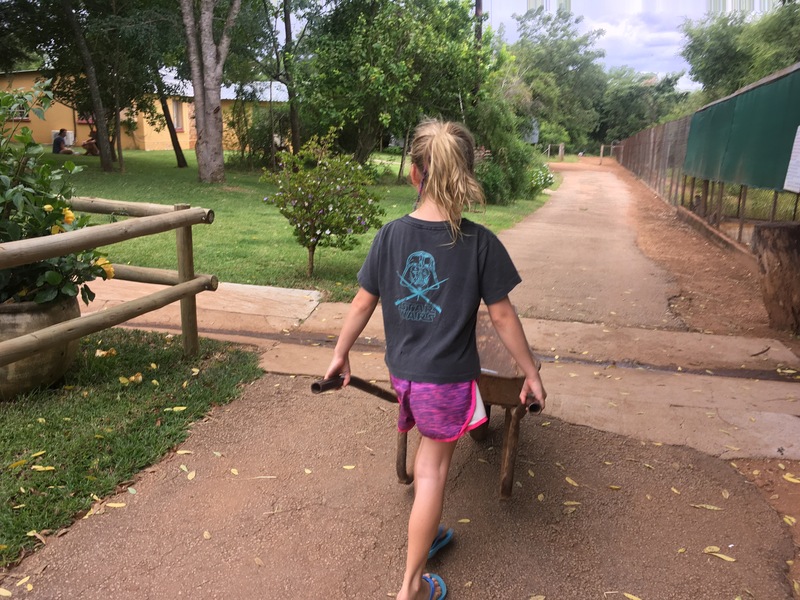 Your time at the rehabilitation center was a true African experience! I know many people who have gone on photo safari or even safari there…but no one who actually worked to help the animals who live in Africa. Thank you for explaining what you did at the center…that is certainly harder work than a day in the classroom at McGehee! 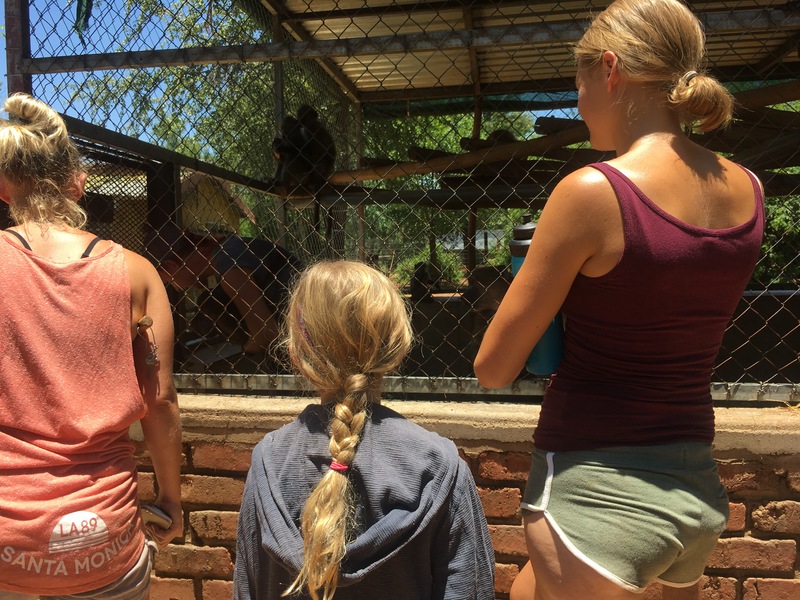 Those monkeys were lucky to have you and your mom as volunteers! The pictures from your road trip to Kruger are awesome. Visiting that park is on my “bucket list”…you will have to tell me more about that visit when you return. Great post Cricket! It was really fun to read. You and mommy were working hard and playing hard. love it! Cricket! This might be my favorite blog post so far. Monkeys have always been my favorite animal. I’m so excited for you that you get to help the monkeys be happy and healthy. I bet you’re having so much fun playing with those baby monkeys the most! Thank you!!!!!! That was my favorite place so far!!! It was hard to be a mommy! Early mornings to feed them. I can’t wait to sleep in tomorrow!